Social Media is how consumers are discovering new products, engage with brands, see how current customers are enjoying their products or services. So how does all these contests, posts and tweets turn into revenue, you ask? According to research compiled by MobStac in 2013, 78 percent of consumers rely on social media to guide their purchases, proving that your social media is either attracting more customers to you or making you unattractive to potential customers, you lost the chance to engage with by not having a strong social media presence. brands who do not implement a strong social media strategy will be ignored. Brands who are solely relying on newspaper, magazine, TV and Radio ads are ignored along with millions of other brands blasting their message on bus signs and TV ads. Successful brands know when using traditional advertising to drive viewers to their social media. The primary goal in using social media is driving traffic back to your website to track customer activities. You need to be unique and creative when designing a social media campaign that is efficient and user-friendly. You have to create a excitement strategy to motivate and excite viewers to engage with your Facebook page to then visit your website for a free offer or contest. E-commerce company, JustFab used a creative strategy to tie social media to their website in a campaign called #JustFabWish. JustFab informed its online viewers and subscribers to look at their online collections and Tweet their wishlist link with the hashtag #JustFabWish for a chance to win their products. The company created exposure for the campaign with an email blast sent to millions of current members and leads. 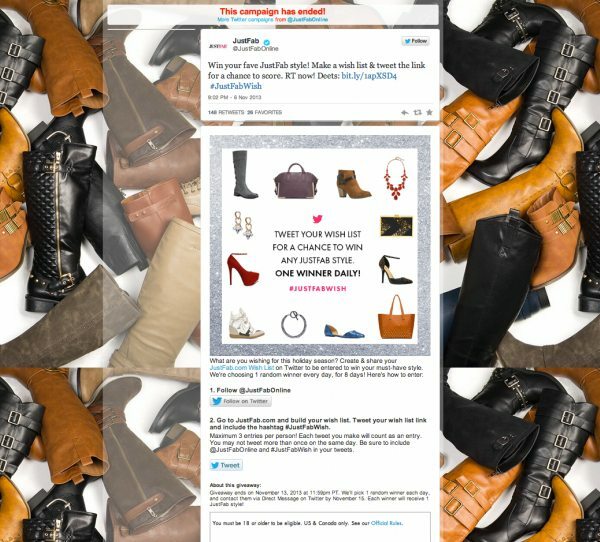 JustFab marketers also promoted the campaign through banner ads onsite, and on Twitter and Facebook. Result: When compared to the prior month, JustFab registered a 140 percent increase in web traffic and a 240 percent increase in revenue from Twitter. The campaign out-performed their second most successful effort by more than 50 percent. Now that is awesome! The campaign required that participants go to the website to submit their entry. Once on the website, potential customers were already browsing products, and one click away from making an online purchase. 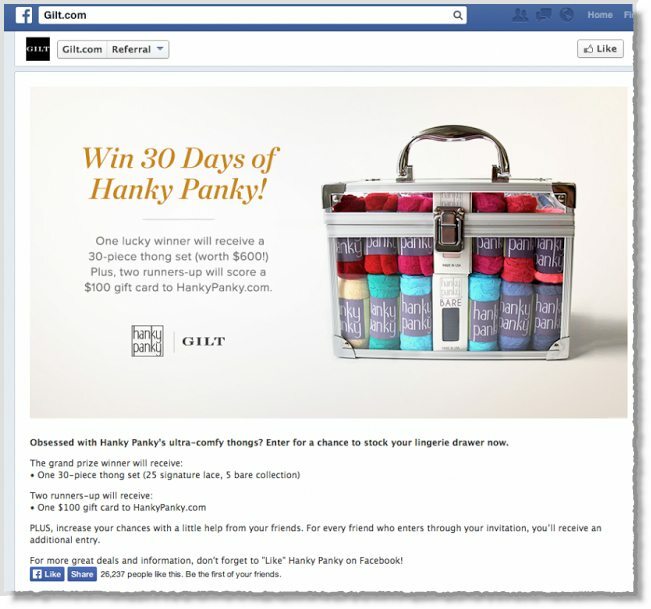 Gilt.com paired digital Ad buys with a giveaway to boost web traffic and partnered with Hanky Panky, a popular retailer of women’s underwear, for a giveaway campaign that highlighted Hanky Panky’s main product on the Gilt.com website. 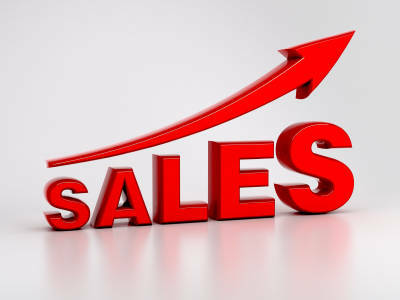 As the entries increased, daily content increased and ads promoting the referral contest, more and more people saw the product therefore, more people wanted the product. Result: More than 45,000 people visited the sweepstakes page during the two-week contest and 21,000 people participated. Gilt.com added 3,000 new social fans that would continue to see their products and be driven back to the point to purchase them. There was more than just one winner in that contest; Hanky Panky earned exposure for a product directly from the retail site. Fashion retailer Lilly Pulitzer decided to tempt online viewers with an Exclusive Offer. They used the power of exclusivity to launch a campaign that granted early access to online sales for those that opted into their newsletter. Their social sign-up program helped create a massive buzz around the launch of the sale. By the time the early birds had their carts filled, there was another group of fans clamoring to get in on the regular launch. The campaign made their social audience excited to get on their website and actually buy product. 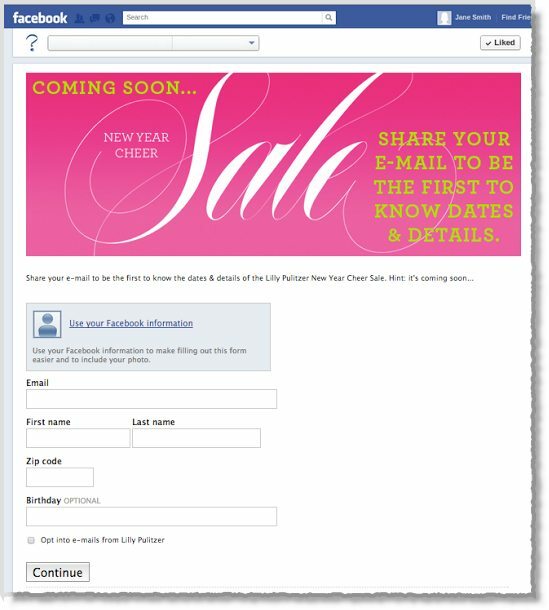 Result: Lily Pulitzer ended up collecting thousands of email addresses of potential customers, doubling the size of their email database and giving the brand a lasting connection with a new customer base. The social teasers and following email campaign translated into measurable revenue during the online sale. Combining Social Media sites and tools are ingredients for a successful social media campaign, such as: email campaigns, Facebook landing pages, Hashtags and contests, is instrumental for brands to increase revenue during and after a social marketing campaign. 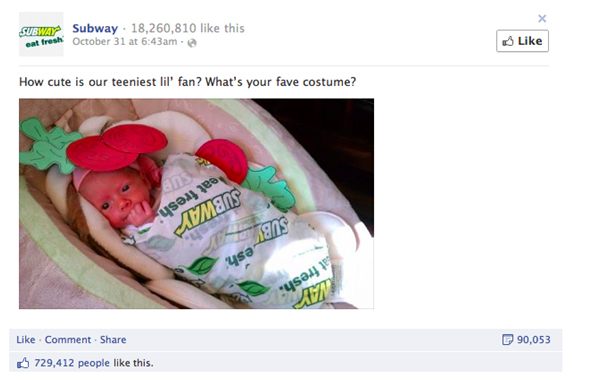 Want to start crafting more engaging Facebook Posts? Go to my Facebook Page for powerful tips to ensure your posts get seen by more people in your target audience at http://www.facebook.com/socialmediawithrita Don’t have the time to create posts? or time to constantly read about Facebook changes on it’s algathorithium, and just want to hire a company that already knows what content is successful then click here to call http://www.socialdominancemedia.com to make your social media pages a success while you just relax and focus on your business. Want Facebook To Post For You for weeks Without being in front of the computer for FREE?!?!?! Here are 5 reasons, you can’t ignore Google+ for much longer. Google Local – Search results on Google now show Google+ pages of the listed websites. For example, I Googled ‘spa in Toronto’ and got results from the local listings- some of them had Google+ links showing up next to the listing. This will definitely build traffic and hence social reviews on their Google+ pages. With greater traction, the social currency of these listings would improve, thereby leading to a much needed network effect for this social platform. SEO – SEO experts are unanimous in their opinion that Google+ links are positively impacting SEO results. So if you are want to improve organic traffic, you’ve got to have a Google+ strategy. There were two developments in the recent past which are significant. First, the new hashtags feature in search results- you search for #hashtag in the search box and it will display the Google+ posts on the right side of the screen. Second, Content Authorship. Google SERPs are impacted by authority. Authority is dependent on the author. Google has provided the opportunity for the publisher to declare the author of the article via Google+. All you have to do is to link your domain email address to your Google+ profile at plus.google.com/authorship. Once you sign up, Google recognizes you as a named author. As you blog, guest blog and publish more and more articles, Google will account for your domain authority and this will have a positive impact on the SERPs for your articles. Picasa – Picture editing has never been easier. Picasa offers features such as ‘Basic Fixes’ and ‘Auto Awesome‘ . These are tremendously useful for amateur photographers (read – almost all of us) and the popularity of the platform is steadily increasing. With a one click share to Google+, picture sharing on this platform is rapidly increasing. This is sure to attract large traffic as demonstrated by Facebook and Instagram. Hangouts – This video chat feature from Google+ is setting new standards for the industry. It is more intuitive, allows more free participants and has better integration with apps such as Youtube and Google docs. Since participants have to sign in via a Google+ account, it is bound to increase the number of users of Google+. One of the most impressive features is the ‘Hangout on Air’ which basically provides a free Live video streaming platform via Youtube. It’s awesome! What made Google the #1 search engine on the planet?? It provided the most effective solutions to people’s problems- You have a problem, or question you Google it. It has become apart of our way of life to Google our problems and questions about anything in our lives from parenting to business solutions. Ensure your content is GOOD and JUICY! Provide the benefits of implementing your solutions, include proof->statistics, testimonials, and case studies. If it is a new problem that has arisen in your industry make sure you are the first one to distribute your content to solve the problem. People will praise you, and see you as to the go to expert or business. You need to be on your A-GAME when it comes to content, stay on top of news in your industry. Make Google your best friend. Google away and write your own articles based on what you read out there. To ensure you get a lot of eyeballs on your content, you need to PROMOTE, PROMOTE, PROMOTE your content. Email your list about your content, distribute it on your social media sites, events, Pay Per Click Ads such as Facebook Ads, and Banner Ads. Develop relationships with influential bloggers, analysts, press, and other influencers of your target market so they can share it to their followers on their email lists, blogs, and social media sites. You can also create a press release, especially if the content is in hot demand right now. When you are offering free high value content such as, a E-book or report install a opt-in form that captures people’s names and emails in exchange for the free report or e-book. This will put your prospects in your email database to follow up with them, with more content that you post on your blog or website. The result is they remember you and continue to follow you. The goal here is that your prospects will keep your business in mind when they need your services or product. You will be seen as to the go to business because they have been educated and entertained by your business. We all know people do business with people they know, like and trust. Delivering free high quality content accomplishes this. KUDOS for the internet and Social Media Sites!